The Spring Course Catalog is published and registration will officially open on February 28. We have courses on politics, gardening, Internet technology, music, French, drawing, religion, meditation, literature, and more. Please join us for another challenging and rewarding semester. 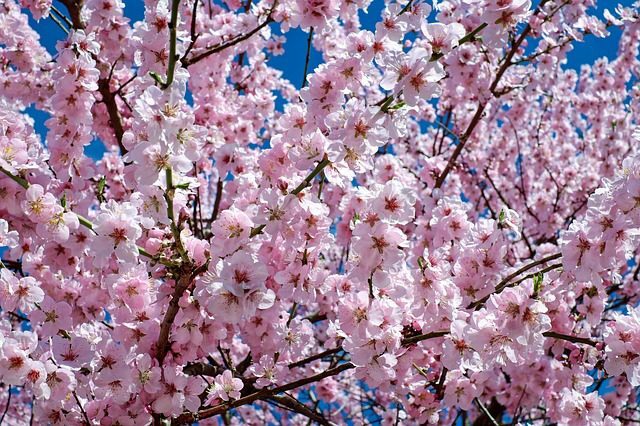 Check out the spring class offerings. 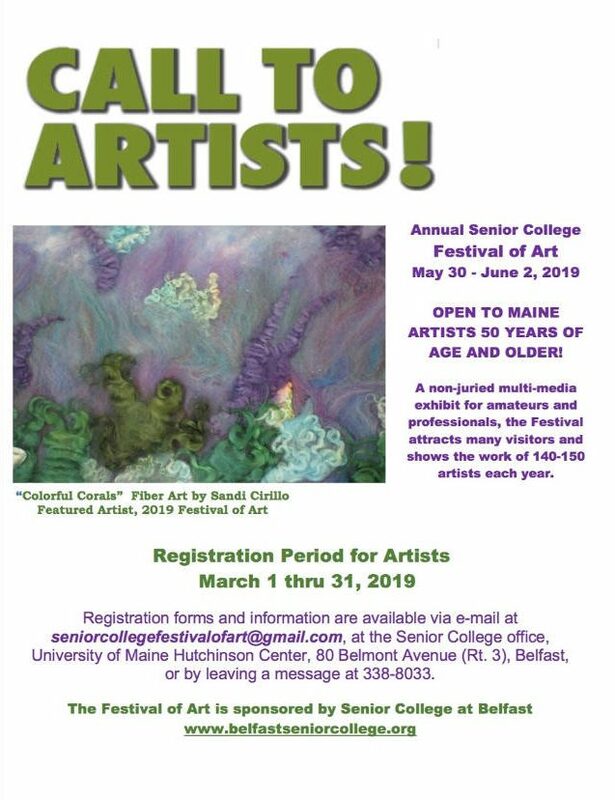 Attached to this post you will find registration materials for the 17th Annual Festival of Art, a special event of Senior College at Belfast. The 2019 Festival of Art Exhibit will be on display for public viewing at the Hutchinson Center in Belfast from May 30 – June 2, 2019. The attached Information Sheet for Artists provides a detailed overview of Festival requirements, logistics, and events. Please note that the maximum dimensions for hanging work are 40” h x 50” w; maximum weight, 40 pounds. Hanging artwork must have a wire on the back that does not extend above the frame. No saw-tooth hangers! The Festival is organized and produced by volunteers. All labor is donated. Senior College at Belfast generously covers all outreach and publicity costs. To cover the rental cost of the festival venue, participating artists pay a $15 registration fee. You may download the attached Registration Form in rich text or PDF format, type or hand write your info in one of those documents, and send your completed form to us by return email or USPS letter mail. If mailing your registration, please enclose a $15 check payable to Senior College Festival of Art for the registration fee. The mailing address appears at the bottom of the Registration Form. If you are registering for the Festival electronically you may pay your $15 entry fee when you deliver your artwork to the Hutchinson Center on May 29th. If you have questions after reading the attached Information Sheet for Artists, please email seniorcollegefestivalofart@gmail.com or call the Senior College at Belfast office and leave a message for the Festival organizers. We look forward to your participation in the 2019 Festival! 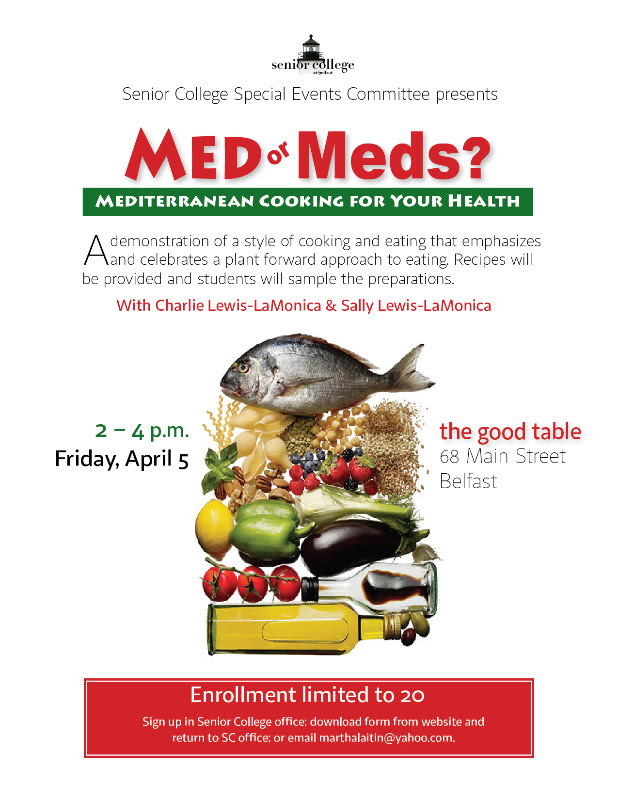 Please register and join us on Friday, April 5 at The Good Table, 68 Main Street, Belfast, for a cooking demonstration of the Mediterranean style of cooking, which features foods like olive oil, vegetables, whole grains, fish and beans. Husband/wife team of retired chefs Sally Lewis-Lamonica and Charlie Lamonica will demonstrate and students will share the foods prepared. Recipes will be provided. Enrollment is limited to 20. Sign up in Senior College office, download registration form on website & return to SC office, or email marthalaitin@yahoo.com. SUMMER: for two weeks before the 1st class, office open on Thursdays, 10 am – 1 pm. 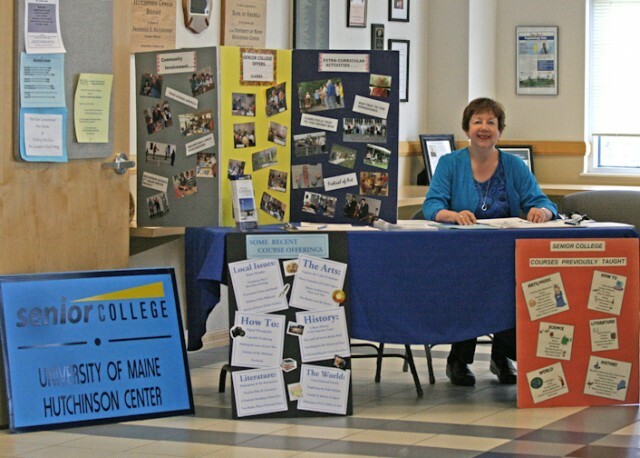 FALL, WINTERIM, & SPRING: starting six weeks before the 1st class, office open on Thursdays, 10 am – 1 pm. Welcome to The Senior College at Belfast, where people meet to exchange new ideas, explore classic and contemporary topics and make new friends. 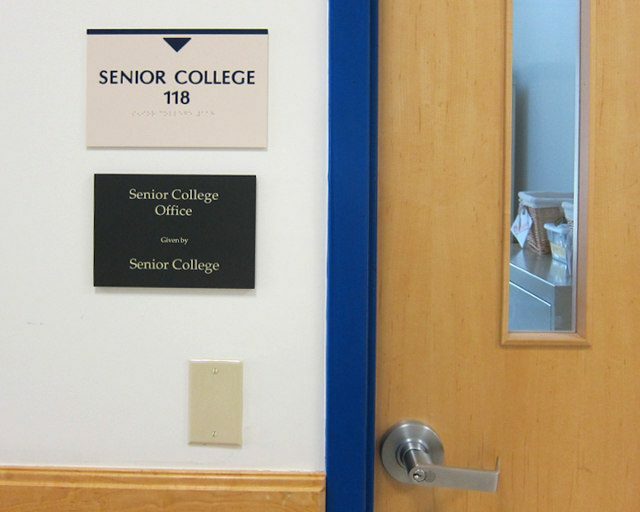 Senior College provides a diverse curriculum of programs, classes and special events for those 50 years and older, along with their spouses or partners. Enjoy subjects ranging from the intellectually challenging to the purely enjoyable. We’re the second largest of the 17 Senior Colleges in the state with more than 500 mid-coast members. Classes meet every Thursday for six weeks during the fall and spring semesters and for four weeks during a January-February “Winterim” semester. Take a look at who we are, what we do and why we can’t imagine life without Senior College!